And that’s the last time I was even remotely testy about my luxurious villa accommodations on Maui. Though not directly oceanfront, the villas of Ho’olei at Grand Wailea far exceeded my expectations. 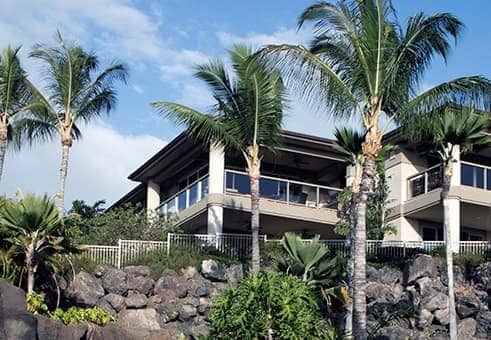 First, the lack of being right on the beach was mitigated by the expansive view of West Maui and the Pacific from my villa’s huge main-level lanai (big enough for a six-seat dining table, grill, and three cushioned chairs with room to spare). Second, the villas were less than a 15-minute walk to the beach at Grand Wailea, its sister property, where Ho’olei guests have signing privileges and pool access. Third, the sheer size and upscale appointments of the three-bedroom Deluxe Ocean Luxury Villas made me feel like a privileged princess living in the lap of luxury. When you visit Maui, you don’t spend a ton of time in your hotel room; there’s simply too much to do and enjoy on this tropical island. That said, this is no standard hotel room. After days spent stand-up paddleboarding, making poke, and driving to Hana, I was more than happy to return “home” (and it did feel like home after a week) to the villa I was sharing with two Viewfinder pals. Viewfinder Tip: Don’t feel like making coffee in your Ho’olei villa? Walk down to the pool for complimentary Starbucks and the morning paper. Even without retreating to our separate bedrooms, we had plenty of space to spread out in the main-level living area—sitting on the aforementioned huge lanai (a.k.a. balcony), kicking back in the vaulted-ceiling great room with a living area and dining area, or perching on a bar stool around the kitchen island. Speaking of the kitchen, these villas come stocked with every appliance—from an espresso maker to a blender and toaster—and piece of cookware you’d want for preparing a gourmet meal, with the help of a massive refrigerator, gas cooktop, oven, microwave, and a dishwasher. Granite countertops and Italian cabinetry add to the swanky ambiance. With three bedrooms, each with queen or king beds and in-suite bathrooms, the villas of Ho’olei at Grand Wailea are an ideal vacation rental for three couples or families. The master bedroom on the ground level is a little roomier and features a bathroom with a deep soaking tub and separate shower, but all three provide plenty of sleeping and closet space. It sounds silly, but the body products in the bathrooms gave me a grin the moment I saw them, not only because the shampoo, conditioner, shower gel, and moisturizer are in oversize containers, but their scent is honey mango—perfect for the tropics! Every villa also has an elevator, a one-car garage (with carport space for additional vehicles), a laundry room, and an additional powder room. As I noted, Ho’olei guests are welcome to visit the Grand Wailea, where you’ll find the full-service Spa Grande (Hawaii’s largest spa), a plethora of restaurants, access to the golden-sand beach, and an amazingly entertaining 27,500-square-foot activity pool with a lazy river and waterslides (kids can’t get enough of this). A quieter place to rest and relax poolside is at the Ho’olei’s intimate, free-form pool with a rocky waterfall and a sandy, zero-depth entry for toddlers. My only caveat for booking a villa here? It’s perched on a hill, which is good for the views of the Pacific Ocean across the street, but if you’re staying at the top of the resort property, it is a bit of a trek to walk home after you, say, spend the day at the Grand Wailea pool area. Of course, you can always call for a complimentary shuttle to transport you right to your villa’s front door. Fitness-minded, I embraced the daily uphill walk to my villa, which was all the better for burning off some of Maui’s culinary treats like fresh fish, Kalua pork, shave ice, and marvelous malasadas. What are your favorite Hawaii accommodations?